Have long hair and need to raise some extra cash? Selling your hair could be the answer. 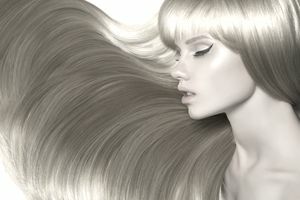 The best wigs and hair extensions are made from human hair, which means healthy hair is always in high demand. And it happens to be pretty easy to sell online. If you're always getting compliments on your long locks, you might want to consider selling your hair. It could be worth hundreds or even thousands of dollars to the right buyer. What are Hair Buyers Looking For? Buyers want thick, healthy, "virgin" hair that is 10 inches long or longer. They don't want hair that has been dyed, bleached, permed, cut into layers or subjected to heat (hot irons, hair dryers, straighteners, etc.. They also don't want your hair, if you smoke or drink. Hair that is washed daily isn't very desirable either. It dulls your hair, and increases your chances for split ends. Think you have the kind of hair buyers are looking for? Here's how to go about selling it. Choose a listing site. There are several websites that specialize in hair sales. Spend some time looking at each one to determine which will work best for you. Here are a few to consider. They all charge a one-time listing fee, rather than charging you a commission. That's really the best way to go. Details about your hair care habits (How often do you wash and condition your hair? What type of shampoo and conditioner do you use? Do you use styling products? A blow dryer? Curling irons? Straighteners?) Do you dye or bleach your hair? Keep in Mind: Your listing should be used to talk up the health and desirability of your hair, so try to show how your hair is special. Set an asking price. Look through other listings (both current and completed) to determine a fair market value for your hair. Be sure to compare your hair to similar listings, or you may not arrive at an accurate figure. (Prices in the high hundreds to low thousands are common). Not sure how much to sell your hair for, or just curious to know what it's currently worth? Use this hair price calculator to find out. Make your sale. Once you've reached an agreement with a buyer, cut and ship your hair according to the buyer's specifications. Braid your hair, and secure both ends with hair bands, so it doesn't become tangled in transit. For your protection, do not ship your hair until a full payment has been received (usually handled through PayPal). Also consider purchasing delivery confirmation and insurance. That way, if your package gets lost in the mail, the post office will reimburse you. When selling anything online, it's best to keep your identity hidden. Avoid using your full name in your listing, and consider setting up a separate email address to handle questions from potential buyers, particularly, if your name is part of your email address. Longer hair is worth more. If you're interested in selling yours, consider growing it out first. Don't cut your hair, until you've made a sale (and have received the funds). The buyer may want the hair to be handled a specific way. If you don't have any luck finding a buyer, consider donating your hair to charity instead. Locks for Love makes wigs for children with medical hair loss, and Pantene Beautiful Lengths makes wigs for women fighting cancer. Note: I am NOT a hair buyer, so please don't contact me to ask if I'm interested in buying your hair. You need to go through the sites mentioned above, if you're interested in selling your hair.